I mentioned before that our reason for towing the Airstream to Chicago was to get a little work done on our backup camera setup. I’ve been working with Mid-City Engineering, the company that sells the module we’ve been using since 2009. 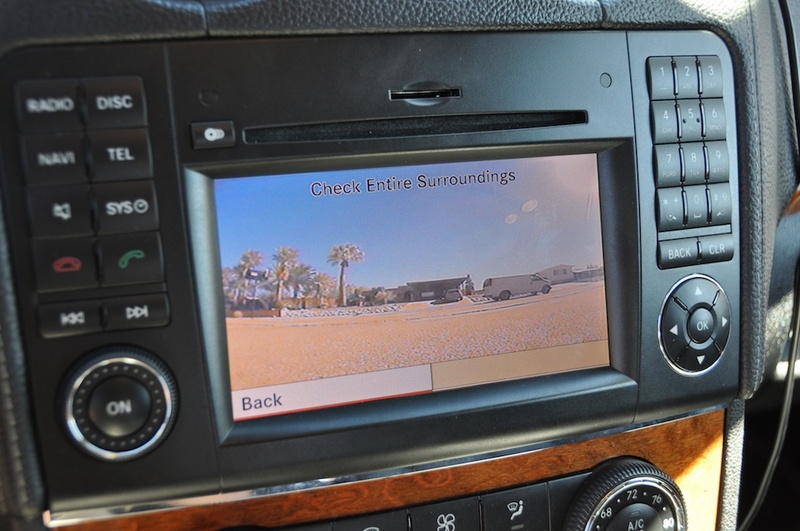 This mod allows me to see the view from the Airstream’s backup camera on the dashboard of the Mercedes GL350. We had some trouble getting the mod to work in the new GL, and I finally decided to brave the inner city and visit Mid-City in person. This took some planning, as their shop is located off an alley and there isn’t much space to maneuver a 30-foot trailer. (The red arrow above shows the approximate position of the Airstream.) The only way in was via what is optimistically called Elizabeth Street. That turned out to be the easy part. The guys at Mid-City fixed us up with a new camera on the Airstream (the existing one was dead for unknown reasons). However, we had to wait until 6:30 for the new camera to arrive at the shop, and so by the time the work was done it was getting dark. Plus, I needed to fuel up the GL and that was never going to work at any of the local gas stations with the trailer in tow. To help out, the Mid-City guys left all the gates unlocked for us based on our promise to lock everything up when we left. They went home around 7:30, leaving us alone in the dark alleyway. The owner offered to let us spend the night there, but we decided to head back to the truck lot downtown. So, I unhitched the GL from the Airstream and very carefully maneuvered the car around the building to go get fuel. If you look closely at the satellite view above you might think there’s no road around the northeast side of the building, and you’d be right. 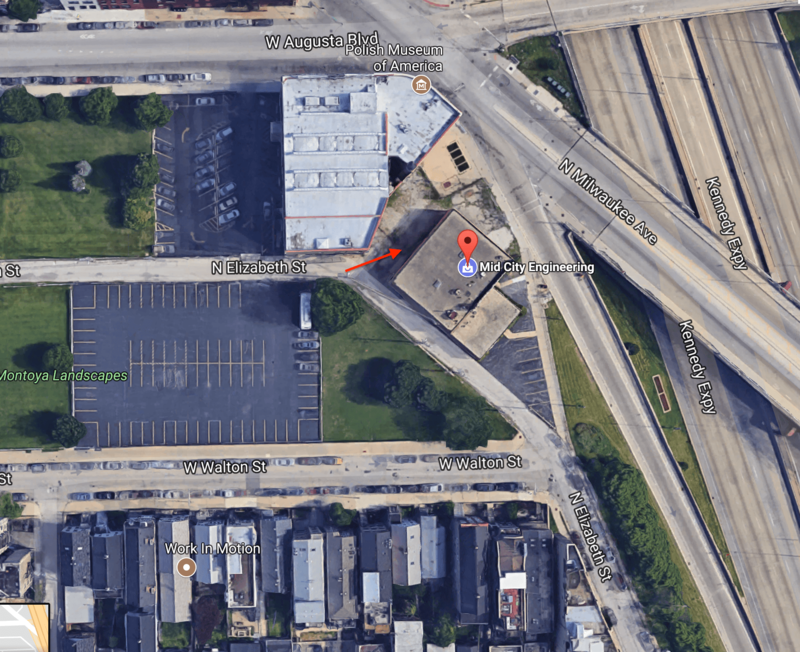 There is just barely space to get a car around the perimeter, inches from the brick building and chain link fences. It took me a few minutes to clear all the obstacles. That still wasn’t the hard part. Coming back, I had to perform the same maneuver in the dark, backwards because the car needed to arrive in position to hitch up again. That took a bit more sweat and care. And yet the biggest challenge was yet to come. 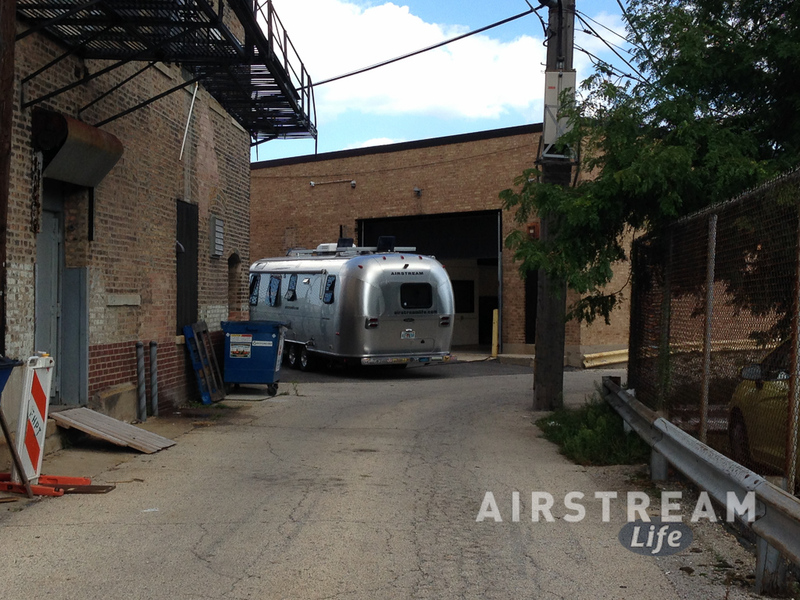 Once hitched, the first step was to carefully back the Airstream onto N Elizabeth Street again, and then go forward (southeast). We couldn’t turn right onto W Walton Street due to cars parked everywhere, so the only escape was down N Elizabeth. On the satellite image this looked easy, but it turns out that at night the residents park on both sides of the street, leaving only a narrow single lane down the middle for traffic to pass. That single lane would be no problem for, say, a Mini Cooper. 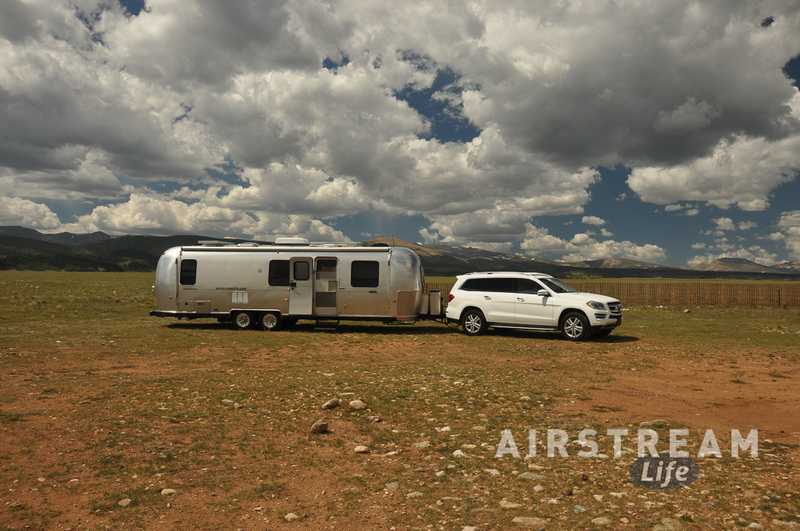 It was nerve-wrackingly tight for the big Mercedes GL, and seemingly impossible for the Airstream, which is 8.5 feet wide. Still, I swallowed hard and decided to go for it, knowing that if we got stuck I’d have to back up—and that might be worse. I wish I had photos, but you know how it is in the moment of crisis. There was a dim light from some streetlamps, and cars parked crazily along the curbs. We literally inched the Airstream forward with Eleanor hanging out the passenger window to look down the side as the Airstream squeezed past parked cars. Our progress was glacial. At many points we cleared cars by about an inch. At several points I stopped the rig entirely to see if we were completely screwed. A local in his car behind us began honking, frustrated at having to wait a few minutes for this aluminum behemoth to clear his street. That always adds to the fun but I’ve learned not to let people rush me so I ignored the honking. Finally, we reached a point about 3/4 of the way down the block where there was simply no possibility of getting through—the cars were parked too far from the curbs and we just couldn’t fit between them. But before that happened, Eleanor began folding the side mirrors of the cars parked along the street. Those inches made the difference, and I was able to creep the Airstream past the final cars, inch by inch, without clipping anything. Did we lock the gate? Of course in all the excitement we forgot about the gate. So we took the first exit, maneuvered our rig through the streets again, but this time did NOT go down the Elizabeth Street alley. I pulled over to the side of a larger road with the flashers on, and Eleanor ran down the alley to lock the gate. 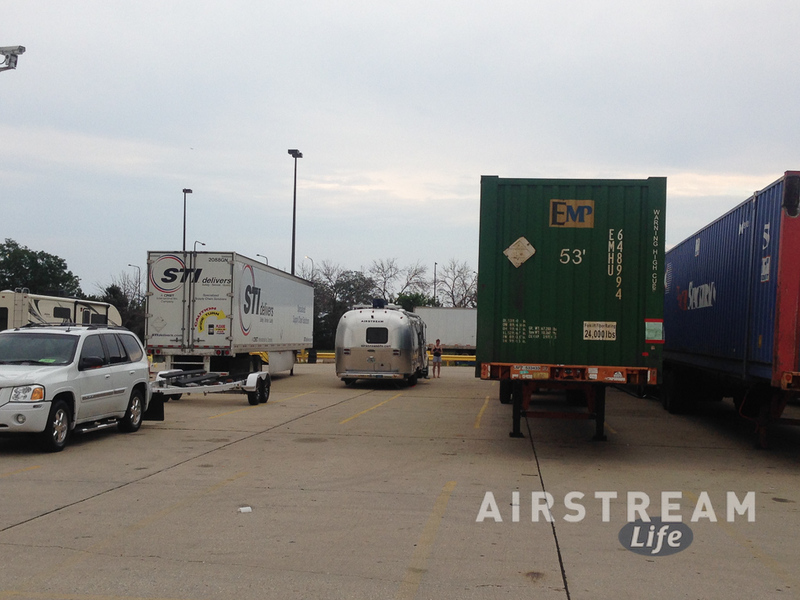 Later, set up again in our space at the truck lot, life seemed very peaceful in comparison. Sure, there was still lots of loud activity around us and we had to run the fans all night for white noise, but the roominess of the truck lot felt pretty good after our alley experiences. 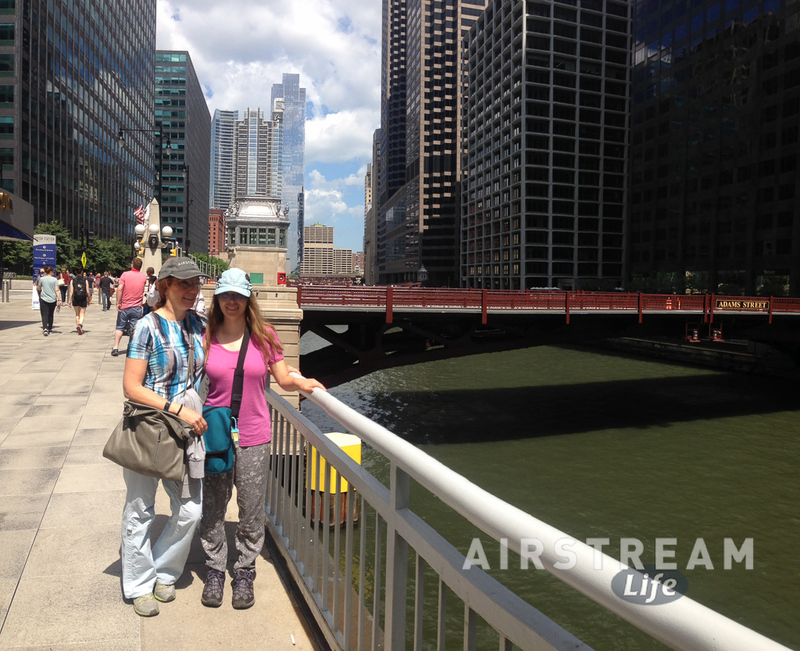 Plus, the weather had changed for the better and we had a free day in Chicago to look forward to. As much as this shortened my probable lifespan I have to admit it was fun to face the challenge. Still, little nightmares like this don’t have to be part of the game for most people. Recreational towing is supposed to be fun. If you would prefer to avoid premature graying I’ll recommend staying off the side streets and alleys of cities. 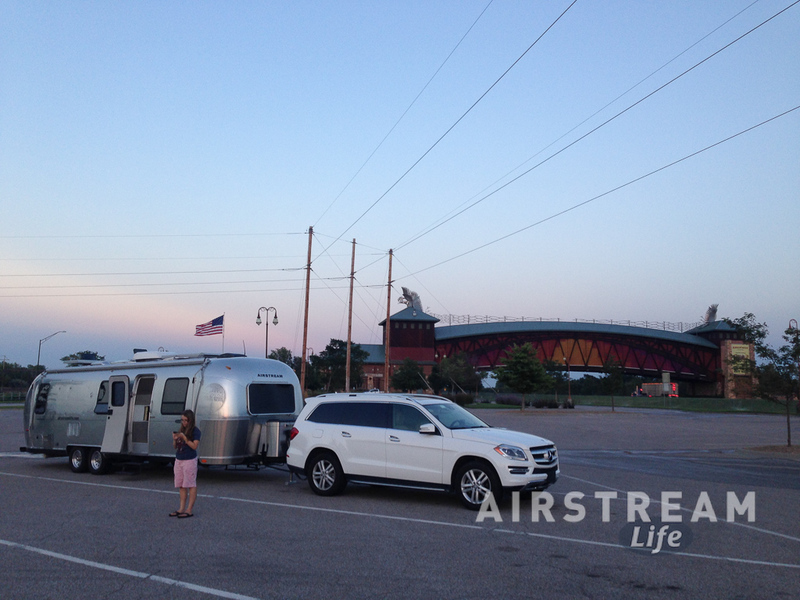 I’ve been towing this 30 foot Airstream around North America for 12 years now and we’ve pulled it through 48 states, so we’ve certainly passed through a lot of major cities. As a general rule, born out of several heart-stopping experiences, I avoid going through major cities like New York, Dallas, Los Angeles, and Chicago. When I have to go through one of those places I try to time it to miss the worst of the traffic. This is one of those times. 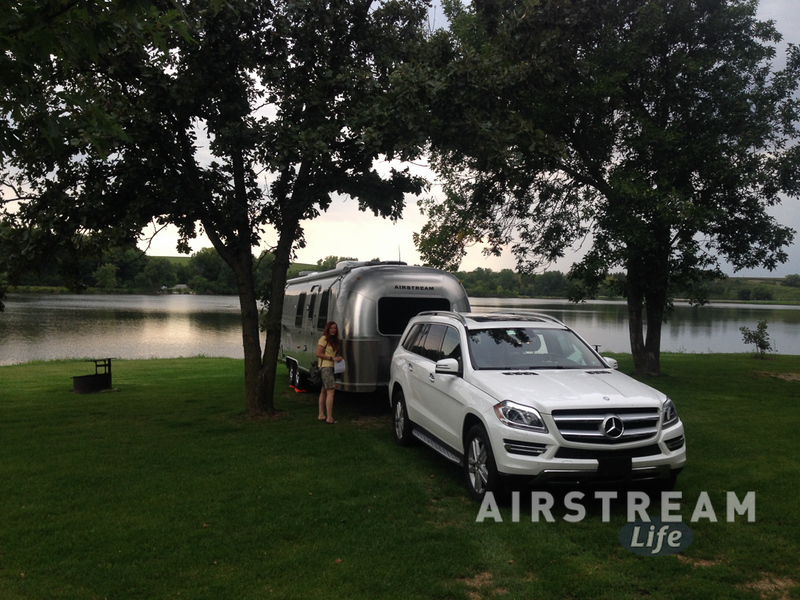 The story starts with our recent purchase of a replacement Mercedes GL350 to tow the Airstream. In the previous GL we used a clever aftermarket gadget that puts the view from our Airstream trailer camera on the dashboard of the Mercedes LCD screen. This little interface box isn’t hard to install but it does require removing the factory radio stack, and half a brain. I was able to find the first requirement among the automotive electronics installers available to me in Vermont, but not the second. The result was an inoperable camera, and no way for me to fix it without a greater set of electronics skills than I have. So I decided to head directly to the manufacturer: Mid-City Engineering in Chicago IL. 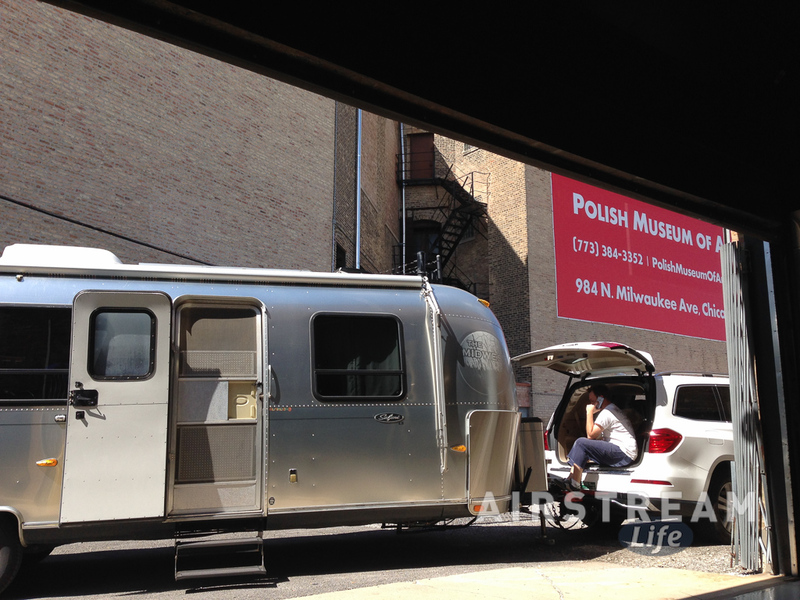 Because they needed to have both the Mercedes and the Airstream in their shop to get the camera working properly, I had to face the terrible reality: we would need to tow the Airstream directly into the heart of Chicago, a place as clogged with traffic as your heart would be after a Quadruple Bypass Burger from Heart Attack Grill. For a family towing a trailer, this is not friendly territory. 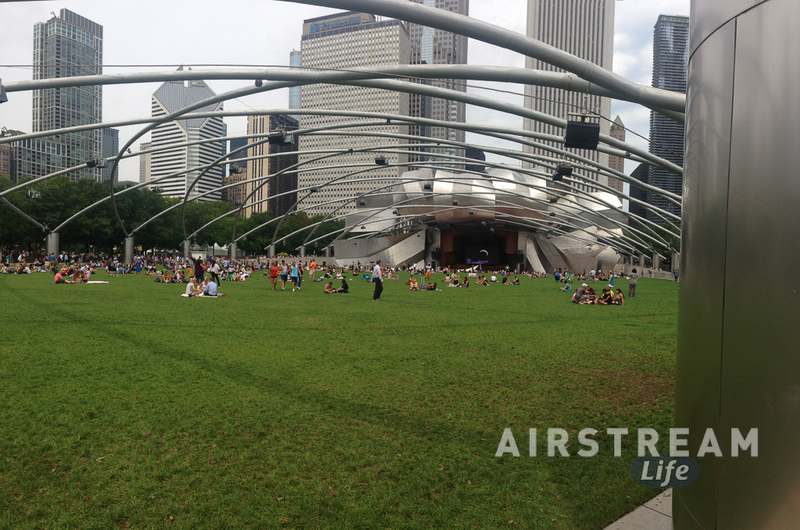 There are no campgrounds in Chicago. 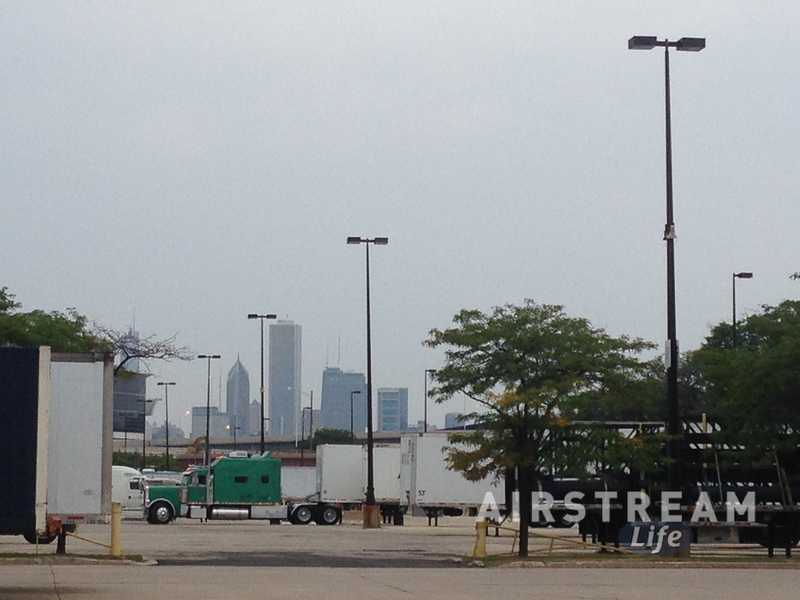 The only place to park overnight with a trailer is the truck marshalling yard at McCormick Plaza, nestled in the bosom of 53-foot trailers, flanked by a busy rail line and four lanes of traffic on Lake Shore Drive. 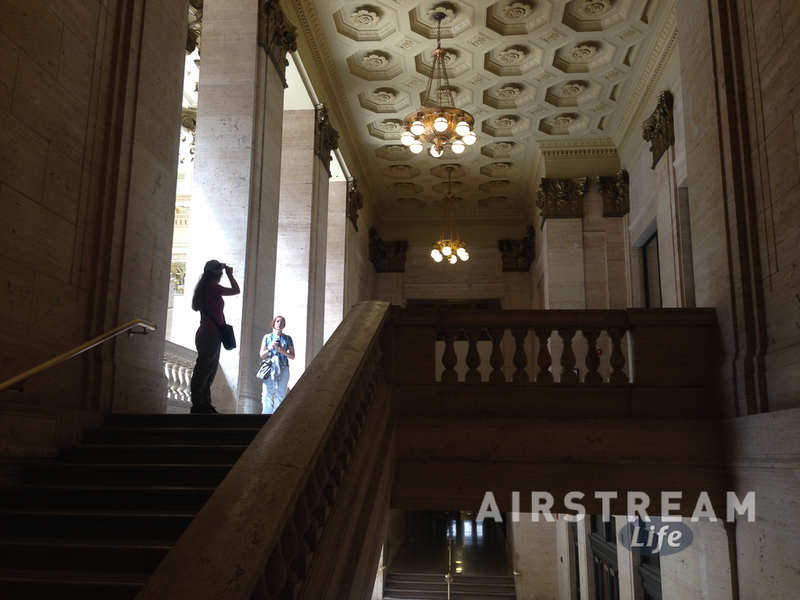 Overhead, jets and an occasional helicopter pass by. It’s kind of like the worst Wal-Mart you ever spent a night at, without the rotisserie chicken and coffee. 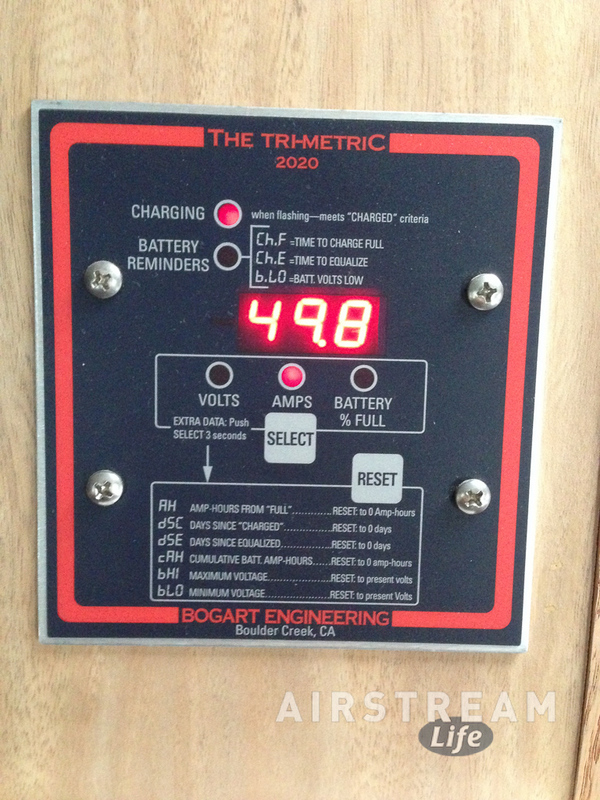 There are no services for the RV’er, so you have to arrive prepared for a siege: full fresh water, empty holding tanks, fully charged batteries, and plenty of food. Getting off the property on foot is difficult due to fencing and minimal sidewalks, so calling a cab is the best choice. 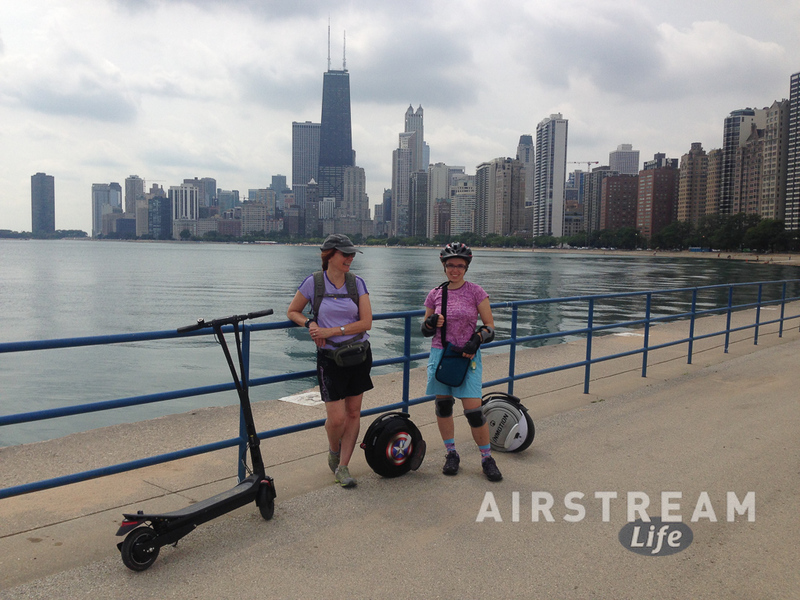 But for all the inconvenience (and $35/day) there is a major compensation: you’re practically in downtown Chicago, and that’s pretty special. We arrived on Sunday afternoon to avoid most of the traffic, which worked (mostly). Unfortunately we hit a pair of hot days with suffocating humidity and of course we had no air conditioning. 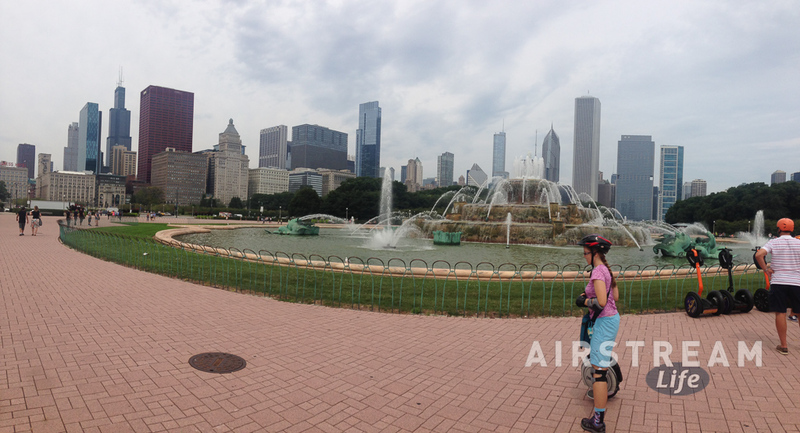 On Monday with the temperatures soaring fast we pulled up the Uber app and got a ride north to Lincoln Park Zoo. 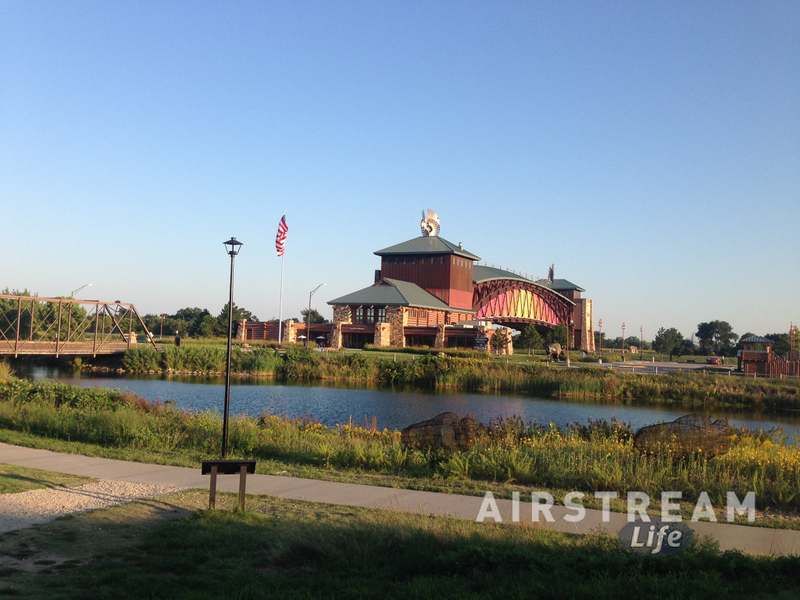 The plan was not to visit the zoo, but instead to ride the Lakefront Trail south all the way to the Museum of Science and Industry. This would bring us past most of the downtown sights. 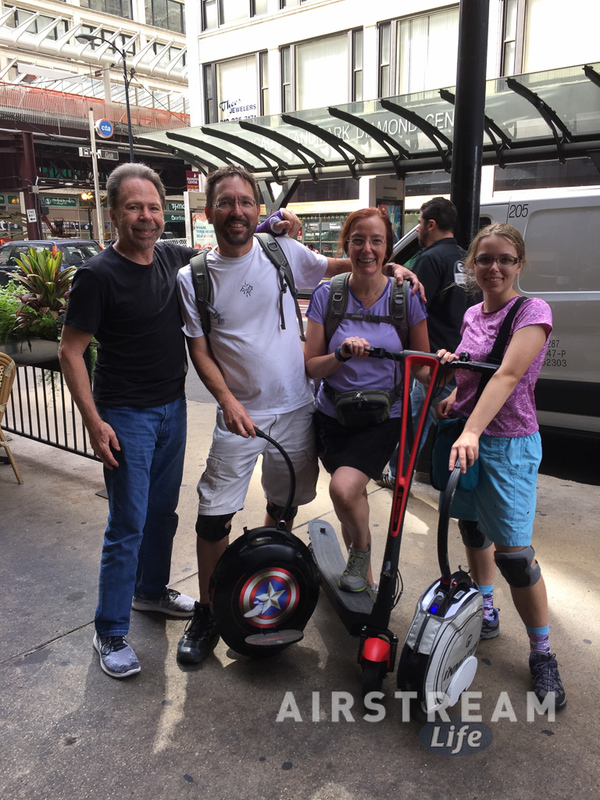 Since it was so brutally humid, we brought out electric transportation: electric unicycles for me and Emma, and an electric scooter for Eleanor. All of them were easily capable of riding the 13 miles of trail, plus a bit extra for side trips. In the photo above you can see the orange Segways of a group tour. We kept passing these tours in the parks. 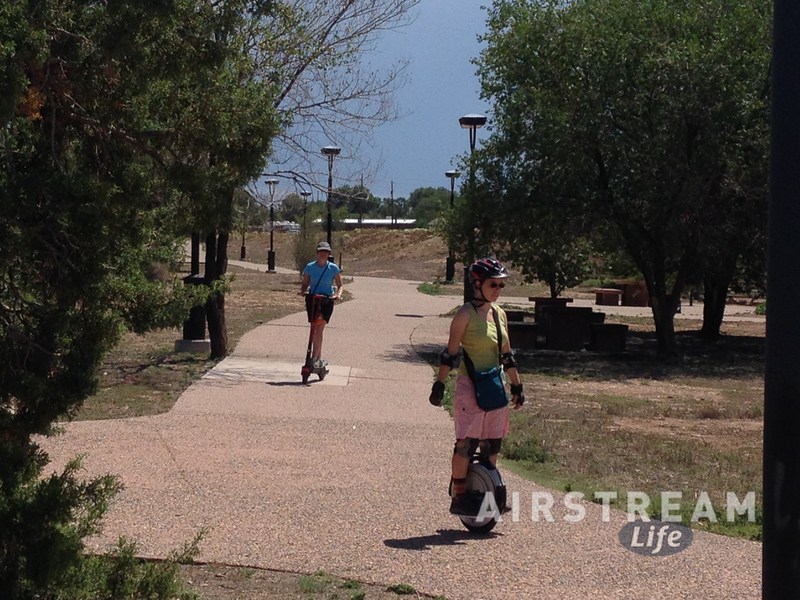 Segways are close relatives of our unicycles, using the same basic technology, but of course much easier to ride. In downtown we met up with a new friend, Chris, for lunch. A fellow electric unicycle rider, on this day Chris was sporting a fashionable purple cast on his wrist. This was the result of a recent fall, so he couldn’t join us for a ride. However, it says a lot about the addictive nature of electric unicycles that he is still looking forward to getting back on his wheel ASAP. We’ll probably meet up in Phoenix this December for a group ride. 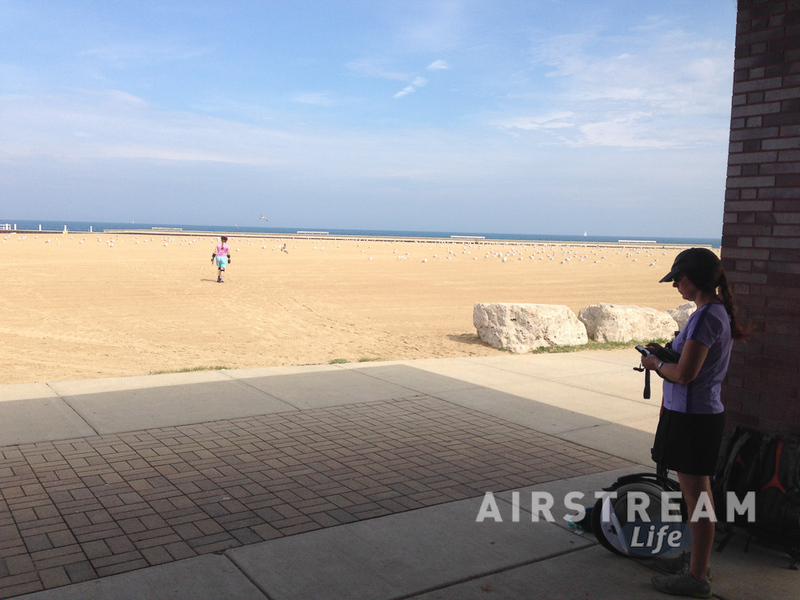 From there we rejoined the Lakefront Trail and continued south, checking out all the major sights and beaches. By 4 pm everyone was starting to feel the strain of a very full day combined with near-90 degree temperatures and sweltering humidity, so when we at last reached the Museum of Science & Industry there was really no debate whether to go inside. 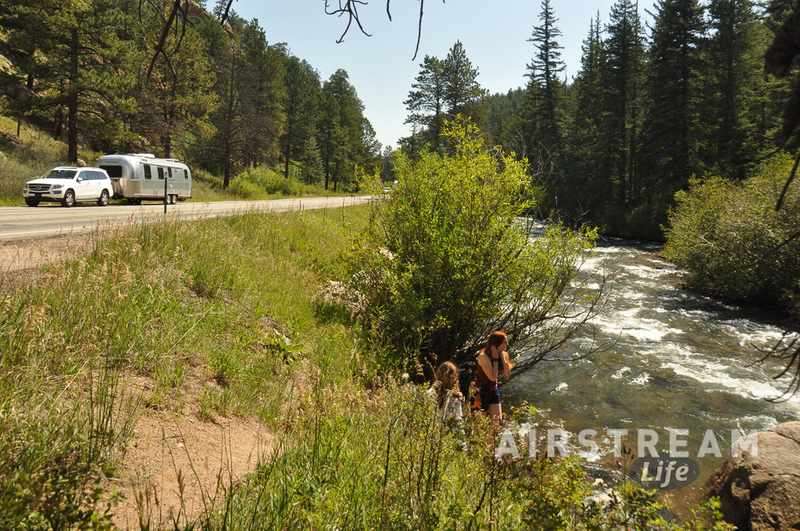 We called for a ride and headed back to the Airstream. 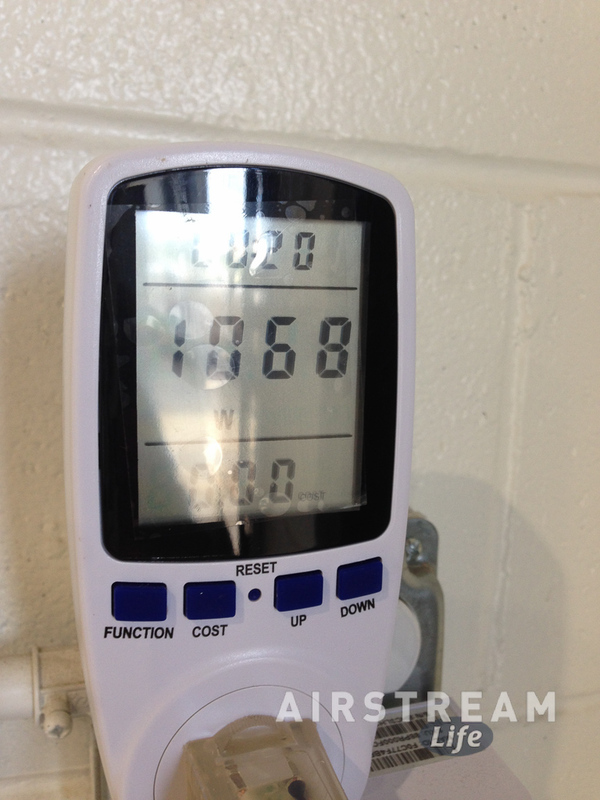 Of course being in the Airstream was not exactly a relief from the heat. We’ve been using the tricks we have learned over the years for staying cool in uncomfortable heat, but the ultimate solution will come from nature when a cold front passes through and dries everything out on Tuesday. We’ll make a decision on Tuesday afternoon, after our service appointment, whether to buy a couple more days of parking in the truck lot or head west to other destinations. Either way, this has been a pretty fun visit to a big city and I guess I’m glad we went through the trouble (and the noise) to be here. It will seem almost surreal in a few days when I contemplate it from the open spaces of the west.